An important part of RPG Meeting mission is promoting online play of tabletop RPGs, both for fans of pen&paper games who can no longer assemble a group to play face-to-face and for fans of computer RPGs who have only played online but would like to try the exciting experience of playing in a living environment that does not follow a pre-scripted plot. In order to replicate the tabletop gaming experience, you use what is called a Virtual TableTop (VTT), an app that performs all the functions normally performed by the materials you keep on your gaming table: paper, pencils, dice, miniatures, battlemaps and so on. 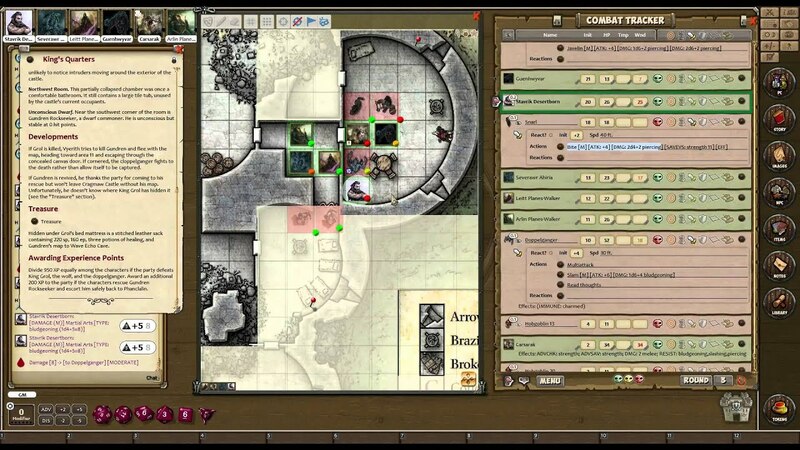 The picture below shows an online game featuring a real D&D® Next® module (The Mines of Phandelver) in progress. The app that we recommend is Fantasy Grounds (FG), a software by Smiteworks LLC that is among the most famous products for online gaming, and the official online VTT for Dungeons&Dragons, Fate, Call of Cthulhu, Savage Worlds and other popular roleplaying games. Promoting the translation of Fantasy Grounds in various languages. Publishing useful tutorials about how to play with a vtt in our online gaming section. Organizing demo games with virtual tabletops.